lift and support the fuel tank. Refer to “fuel tank removal and installation” .
) Place a rag under the fuel feed hose (1) and disconnect fuel feed hose from the fuel pump. Connect a proper fuel hose (2) to the fuel pump. 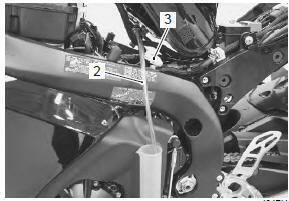 Place the measuring cylinder and insert the fuel hose end into the measuring cylinder. Disconnect the fuel pump lead wire coupler (3). Connect a proper lead wire into the fuel pump lead wire coupler (fuel pump side) and apply 12 v to the fuel pump (between (+) y/r wire and (–) b/w wire) for 10 seconds and measure the amount of fuel discharged. If the discharge amount is out of the specification, the probable cause may be failure of the fuel pump or clogged fuel filter. the battery must be in fully charged condition. After finishing the fuel discharge inspection, reinstall the fuel tank. Refer to “fuel tank removal and installation” .